Home » blog » What Is Purple Corn Flour? There aren’t a lot of purple plants that grow in nature so if you’re trying to follow a diet full of rainbow colours, this is a tasty and healthy addition. Purple corn flour is considered to be a superfood since it is loaded with antioxidants. It is made from purple corn that comes from Peru and it grows both inland and along the coast. Purple corn can come in different varieties and evidence of the corn being used as a food item and as an ink or paint dates back 2,500 years or more. It can be added along with regular whole-grain or white flour in just about any recipe where flour is called for. Simply use 1/3 of the purple flour along with 2/3 of the flower you’d usually use. Purple corn contains many phytochemicals including anthocyanins and phenolics. These phenolics are well-known for both their functional and bioactive properties. Studies have proven that food with a high anthocyanin and phenolic content provide the most antioxidant benefits. 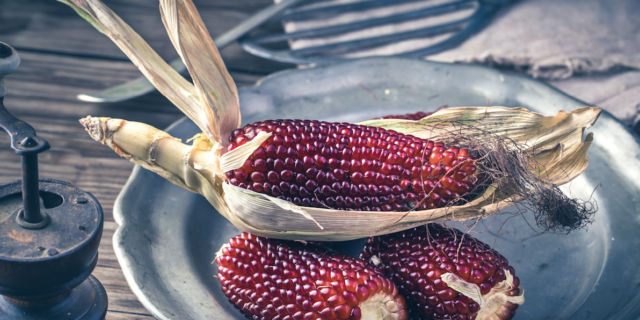 Anthocyanins produce red, purple or blue colours and this corn has an even higher antioxidant count then blueberries. It is a true superfood that deserves more recognition since it can be used in so many different ways to add more nutritional value without significantly changing the integrity of the dish. Plus, it also adds a wonderful colour to the prepared food! Consider using this flour for tortillas, breads, muffins, pancakes, cakes and crackers. To learn more about purple corn flour and how you can order bulk quantities of this gourmet ingredient at a discount price, please visit our website at epigrain.com. While on the site you can feel free to browse through the other high-quality, chef-grade ingredients that are also offered in larger quantities at discounted prices. Epigrain is where to buy wholesale organic grains in bulk.